Grapes are a non-climacteric type of fruit, generally occurring in clusters. Grapes can be eaten raw or they can be used for making wine, jam, juice, jelly, grape seed extract, raisins, vinegar, and grape seed oil. Grapes are considered healthy foods because they are rich in minerals, vitamins, fiber, and other nutrients. Fruits are high in glucose and fructose, but should still be a part of the diabetic diet for the many benefits they offer to your body. 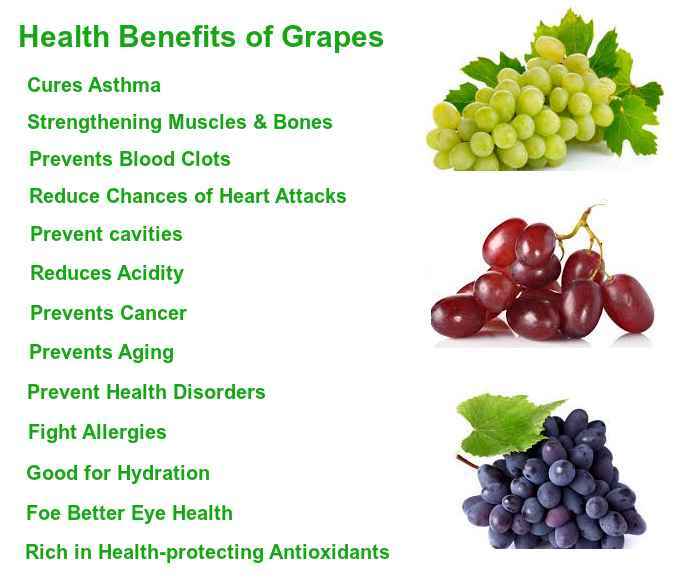 Here on these page we will see various health benefits of grapes. White or green grapes are the sweetest. Red grapes have the simplest flavour. Blue/black grapes taste the best if their colour is deep and rich. Grape juice is obtained from crushing and blending grapes into a liquid. The juice is often sold in stores or fermented and made into wine, brandy, or vinegar. In the wine industry, grape juice that contains 7–23% of pulp, skins, stems and seeds is often referred to as “must”. In North America, the most common grape juice is purple and made from Concord grapes, while white grape juice is commonly made from Niagara grapes, both of which are varieties of native American grapes, a different species from European wine grapes. In California, Sultana (known there as Thompson Seedless) grapes are sometimes diverted from the raisin or market to produce white juice. Red wine may offer health benefits of grapes more so than white because potentially beneficial compounds are present in grape skin, and only red wine is fermented with skins. The health benefits of grapes include their ability to treat constipation, indigestion, fatigue, kidney disorders, macular degeneration and the prevention of cataracts. Grapes, one of the most popular and delicious fruits, are rich sources of vitamins A, C, B6 and folate in addition to essential minerals like potassium, calcium, iron, phosphorus, magnesium and selenium. Grapes can be used as a cure for asthma. Due to their well-known therapeutic value, grapes can be used as a cure for asthma. Grapes increase the nitric oxide levels in the blood, which prevents blood clots. Grapes are an effective way to reduce the chances of heart attacks. The polyphenols found in grapes, have been shown to reduce the risk of heart disease by reducing platelet aggregation which prevents blood clots, protect low-density lipoprotein or “bad cholesterol” from free radical damage, lower blood pressure, and improve the function of blood vessels. Grapes can substantially reduce the acidity of uric acid and they also help to eliminate acid from the system. Grapes can prevent age-related loss of vision and macular degeneration. Grapes play a pivotal role in preventing a multitude of health disorders and can be used as a home-based remedy for several ailments. Dried grapes, known as raisins, are also extremely nutritious and can help treat many disorders, including constipation, acidosis, anemia, fever, and sexual dysfunction. Raisins can also help people gain weight quickly and protect the health and functional integrity of their eyes. Grapes may help to alleviate symptoms of allergies including runny nose, watery eyes and hives. There have been no human studies done to prove this theory. Grapes are high in antioxidants important for eye health such as lutein and zeaxanthin, and red grapes contain the phytochemical resveratrol in their skins, the antioxidant synonymous with wine known to lend protection from several chronic diseases and conditions. Grapes are rich in health-protecting antioxidants, including resveratrol and flavonoids. These antioxidants are found mainly in the skin, stem, leaf and seeds of grapes, rather than in their pulp.